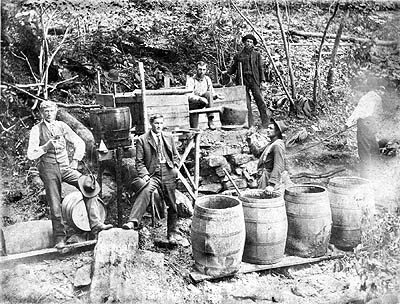 Stories and pictures gathered from all around far Southwest Virginia give the details of old-fashioned moonshine making in the secretive hollows of Appalachia. To buy this book, print the Order Form and mail it with your check or click the Add to Cart button below to pay by credit card via PayPal. Margie Hayes Lawson, daughter of moonshiner James Hayes said: "A farm don't make no money. Grow corn and get money in a jar!" The Scots-Irish farmers in the Virginia mountains made whiskey for generations prior to Prohibition, and they weren't about to halt that home craft when the government enacted laws against it. The making of moonshine in the hills and hollows is recalled by the storytellers, many of whom have first-hand knowledge.